Antique beams and vaulted ceilings blended with exceptional décor gives guests the rustic, charm look they desire for their venue. Schedule a tour to book your next event. Built in 1920, The White Barn at Happy Valley is a traditional farmstead settled in the country side of Nampa, Idaho. With over 6,000 square feet of custom restorations and unique design, The White Barn captures authentic country elegance with both indoor and outdoor accommodations. Recently restored, The White Barn features dual rustic staircases, hand- crafted chandeliers, and bridal party suites that boast exceptional charm. The loft is 3,000 square feet and features wood floors throughout. Here you can view the barn’s original artistry; featuring 30 ft vaulted ceilings and exposed beams that along with the original wood siding make for a truly rustic, elegant setting. Original hay loft doors that open to the outside make for picture perfect wedding photos. The bridal suite features exclusive furniture pieces and beautiful décor that accommodates the whole bridal party. The suite features a hair and make- up vanity with mirrors and a dressing area so the party doesn’t have to leave the room. You will find plenty of mirrors and storage space for all-party sizes. A Victorian couch and bench are showcased for plenty of seating for all guests. Several other details have been purposefully added to ensure that getting ready is not only stress free, but picture perfect. The groom’s quarters is packed with elements to keep the groom and his party happy up until the big moment. 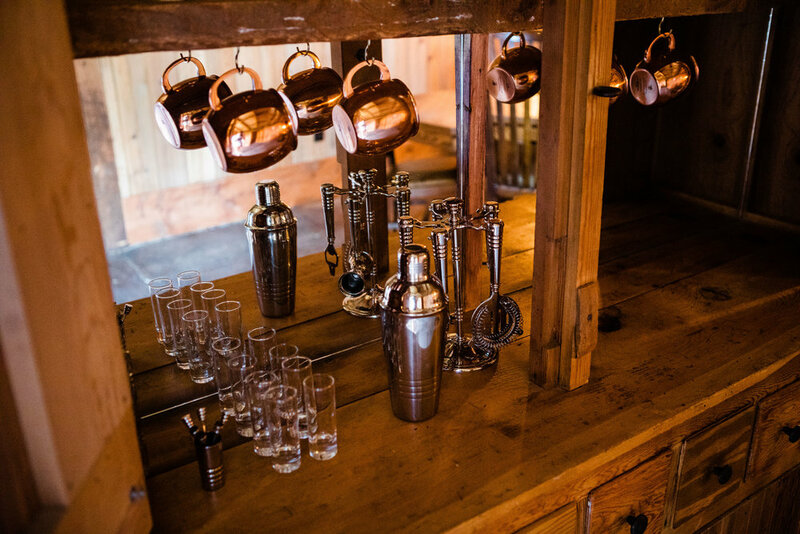 The original barn medicine cabinet has been re-purposed into a whiskey cabinet which shapes the room. Other amenities include a flat screen television, pool and poker table. Also a bench has been added to accommodate extra seating with additional storage as well.